This is the annual celebration of the life of Lama Je Tsongkhapa, Losang Drakpa (1357-1419), the founder of our lineage. It is a Buddha Multiplying Day where karmic results are multiplied by one hundred million times. As part of this event we will perform an extensive Medicine Buddha Puja to pacify earthquakes that will happen in California, Nepal, and other places. Lama Zopa Rinpoche is strongly recommending for us to do this practice multiple times before February 2016 in order to pacify earthquakes that are predicted to happen. 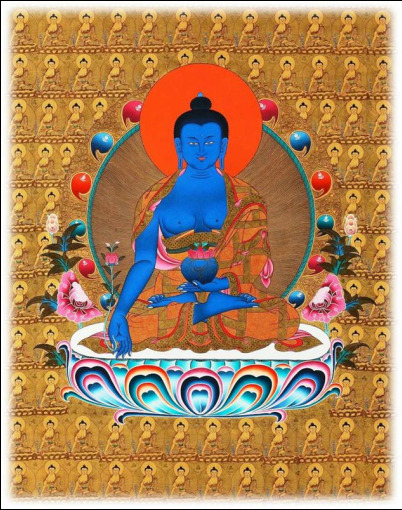 The extensive Medicine Buddha Puja was composed in 1673 by the Fifth Dalai Lama, Ngawang Losang Gyatso (1617-1682). It is an elaborate rite for the worship of the Seven Medicine Buddhas, Buddha Shakyamuni, and an assembly of bodhisattvas and guardian deities.